You can update your password at any time, or, if you've forgotten your password, you can reset it. Learn how in the user guide below! If you'd like to change your password, this can be done via the Settings menu. You will need your original password in order to do this. 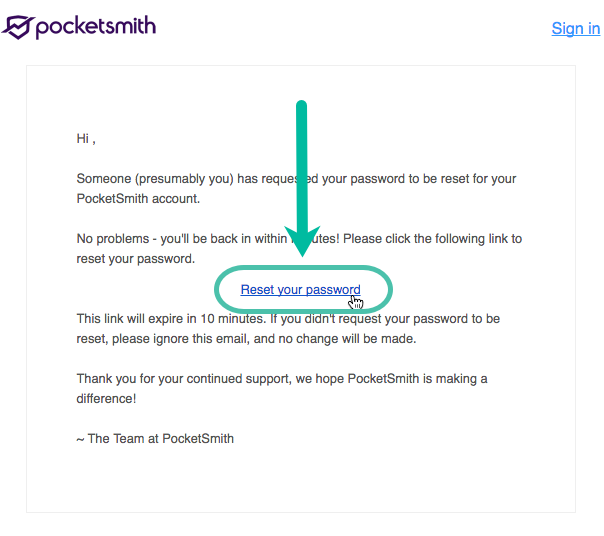 PocketSmith will never send you your original password, for security reasons. However, if you've forgotten your password, we can send you an email so you can set up a new one. Go to the password reset page here: Forgot your password? Enter the email address used for your PocketSmith account and select Email me! You'll need to make sure you click on the link in the email we send you within ten minutes of the email being sent. If you do not open the email and select the link within this timeframe, you will need to request another password reset email.